Subway into SoCross: could it be re-opened? I had been going to write a blog post asking people what this thing is, on Little Collins Street. If one looks closely, it has City of Melbourne markings. The City of Melbourne and the Herald Sun have highlighted it overnight: it’s an old entrance to the subway underneath Spencer Street, into the nearby station. At the old Spencer Street station, the main way on and off the platforms was via the subway. It took you past the ticket offices to multiple exits, mostly along the western side of Spencer Street (the street), but one or two went under the road to the other side; I seem to recall one ending at a spiral staircase in a nearby building. I suspect the exit on Little Collins Street might be the only one still in existence. If you want a reminder of how the old Spencer Street station (including the subway) looked, check this web site. Marcus Wong also has some great photos, including this of the subway. Public access to the subway was removed when the station was rebuilt — but for some reason nobody seems to have anticipated that passenger/pedestrian traffic would swamp nearby streets. 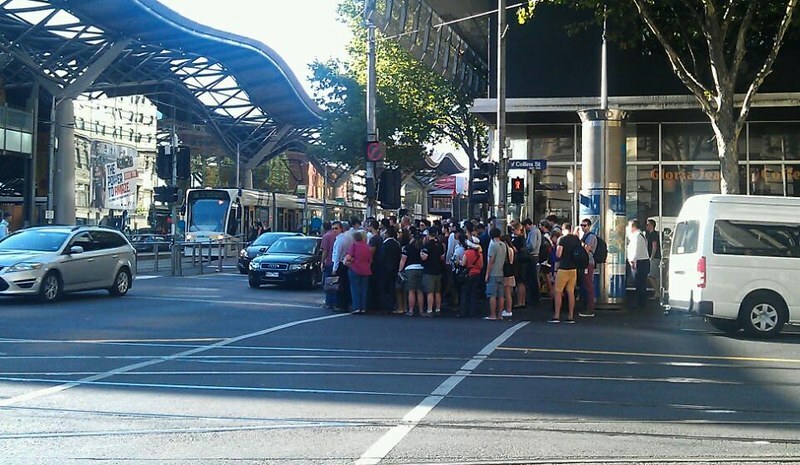 It’s now a regular occurrence to see footpaths in Collins and Bourke Streets overflowing, particularly at peak times. The Elizabeth Street Streetscape works are on hold until the timing and resolution of the tram track realignments at the southern end have been agreed with the Melbourne Metro Rail Authority. Given the funding was from the Parking Levy it is necessary to reallocate the majority of these funds within this financial year. 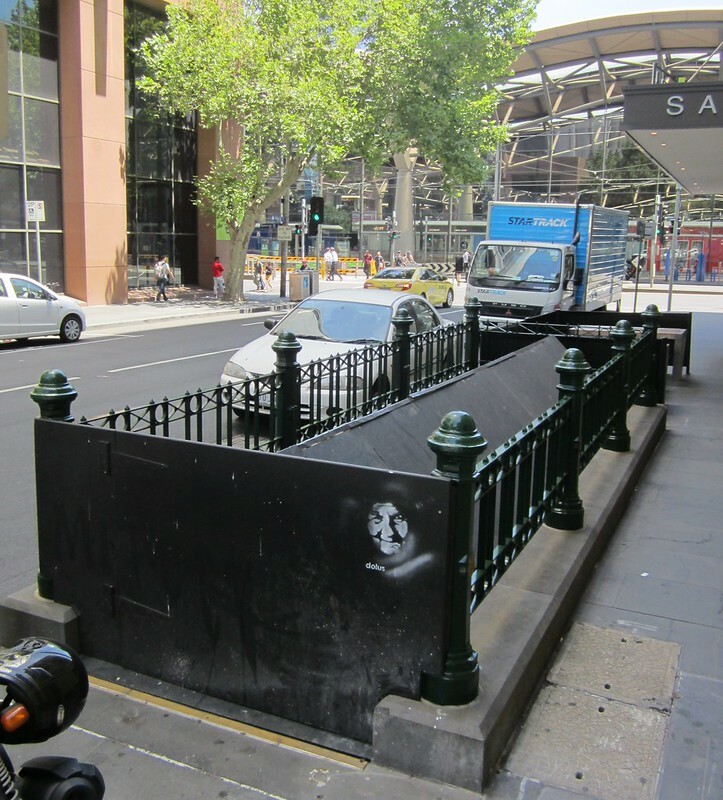 It is recommended to Council that $1.7 million from the Parking Levy Funding be reallocated to the upgrade of the footpaths in Collins Street between Spencer and Market Streets to provide a better walking environment for pedestrians and commuters at Southern Cross Station and $750,000 be allocated towards an investigation and documentation to the reopen the subway from Spencer to Little Collins Street. The balance of the funding will remain with Elizabeth Street in order to progress this project into the next financial year. As I understand it, much of the structure is still in place. The western end is used by service vehicles — you can see the entrances on many of the platforms for them — but if the eastern end under the road is there but unused, there is potential there, perhaps with it popping up somewhere in the main concourse. The Little Collins entrance is steps only, so unless heavily modified, it wouldn’t be DDA-compliant. But like the Campbell Arcade/Degraves Street subway at Flinders Street Station, for able-bodied people it could provide an alternative, traffic-light-free way in and out of the station which could take pressure off the other accessible but very busy intersections. Coming from overseas, I noticed that many Melbourne underpasses seems to have been closed where it seems to make sense to have them. Were they done for safety reasons? I was waiting on Platform 9 at SoCross last night (Wednesday) and saw a transport vehicle carrying two elderly commuters and their luggage. The transport had come up the ramp from out of the double doors which formerly serviced the subway. It took me by surprise, as it was the first time I’d seen members of the public access the platform from that part of the station. As paul implied The travellers aid vans that operate from near the NSW countrylink ticket booth/vline luggage booth seem to have permission to travel over them to get people to both metro and vline platforms. Wonder if a member interested public could use that method to get under there to take some photos, just ask to go to platform 14/15 for the full journey. It’s unfortunate that, just like at Melbourne Central, the easiest ways for people to access the station have been closed so as to force people to walk past countless shopfronts. You can still exit the station directly at Melbourne Central but they are building on the north side of Latrobe st at the moment. There is a an exit to Latrobe st just up the first set up escalators also. Is a pity they did not keep the direct access as it makes it harder to catch the train there and get out of the station in emergency situations. Tom I remember something in that area too. I thought it was a glassed foyer though, so it might have been a different building. That’s what I thought they were talking about on the radio this morning, because I wasn’t aware of the one in the footpath. I agree that the Campbell Arcade/Degraves Street subway is very useful Daniel. I use it all the time (when it is open). However, I wonder whether the new Melbourne Metro project will impact on its accessibility in the future? If they are smart enough, it could provide an entrance to Flinders Street and CBD South stations. Here’s to some hope! I was with the plan until I saw this extraordinary figure, ‘$750,000 be allocated towards an investigation and documentation to the reopen the subway from Spencer to Little Collins Street’. That is like 3/4 of a million dollars! And that is only towards, not necessarily fully funding an investigation and documentation, let alone actually drawing up plans. I have an old person’s headache and I am going to bed. I’m pretty sure I remember that the subway split into three – one went to the rolladoor that Tom mentioned, one went to the stairs that Daniel photographed, and the third went to the open forecourt in front of 120 Spencer St (the old Board of Works building). That forecourt has since been glassed in, hence Philip’s confusion I think. the roller door from what I remember had a long ramp(not stairs), which should make it handicap accessible. Parliament is an interesting case. Every passenger exiting at the La Trobe St exit has to cross a road to get to their destination. Most have to cross two roads. Police regularly patrol the poorly designed exit/intersections to book jaywalkers. Closing Spring St at the corner of La Trobe would help. As I come from Sydney and am use to the network of tunnels spreading out from Town Hall station, I often think that building a tunnel through to 2 Lonsdale St/Madame Brussels Lane would also help. The southern exits aren’t much better. Is it possible to tunnel through to 1 Macarthur/1 Treasury and 35/55 Collins St? What was the thinking. Here we are all about grade separations, and what did we do, remove a bridge and put in a level crossing that has already killed people, including that girl who got killed by that garbage truck. All we really need to do is, reopen the length under Spencer Street, put in those old ramps, just so people can get across Spencer Street without doing so on the level. Some direct access to the platforms, via the old subway all the way, would naturally be a benefit. I hope they at least put in the old food court they had down there.